Project 28 was approved in 2003, and construction of the lead ship, INS Kamorta was started in August 2005. 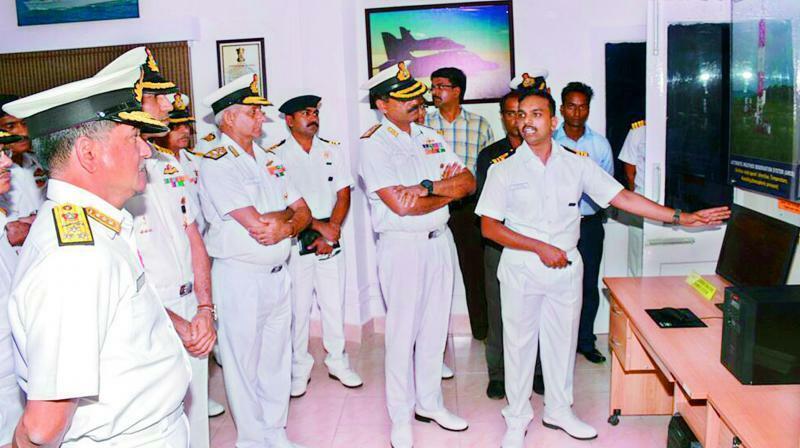 Commander-in-Chief of Eastern Naval Command goes around the Integrated Automatic Aviation Meteorological System (IAAMS) after the inauguration at INS Dega, the Naval Air Station in Visakhapatnam on Friday. Visakhapatnam: Defence minister Nirmala Sitharaman will commission indigenously built INS Kiltan, an anti-submarine corvette here at Eastern Naval Command (ENC) in Vizag on October 16. It will be the Nirmala Sitharaman’s first visit to Vizag city after she took over the new portfolio. Sources said that that the INS Kiltan represents a leap forward in the Indian Navy’s attempts at indigenisation with as much as 90 per cent of its content drawn from India itself. Kiltan is named after an island in Lakshadweep. INS Kiltan is third of the four Project 28 warships. Project 28 was approved in 2003, and construction of the lead ship, INS Kamorta was started in August 2005. Two of the four corvettes, INS Kamorta and INS Kadmatt were commissioned in 2014 and 2016 respectively. The remaining one INS Kavaratti is under construction and is slated to be completed by the end of 2017. The keel of INS Kiltan was laid in August 2010 and it was launched in Kolkota on March 26.